Smart Tweezers ST5S-BT2 is a new device based on the ST-5S model, with all the same features and high basic accuracy with the ability to send data via Bluetooth to any communication software, such as NI LabView® or Windows' Smart Tweezers Bluetooth Utility, as well as dedicated apps for Android and iOS. The ST5S-BT2 model is able to receive data also, including specific measurement settings set by custom profiles. 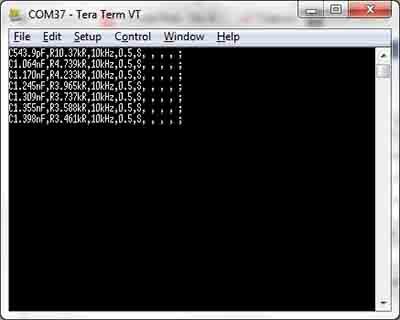 ST5S-BT2 connects to a device using a USB receiver stick that establishes a virtual serial port. 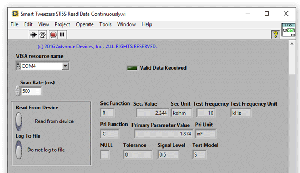 (Note: The receiver stick must be used with PC and NI LabView® software). The measurement values are sent in a comma separated string of values that represent what is present on the device's screen. 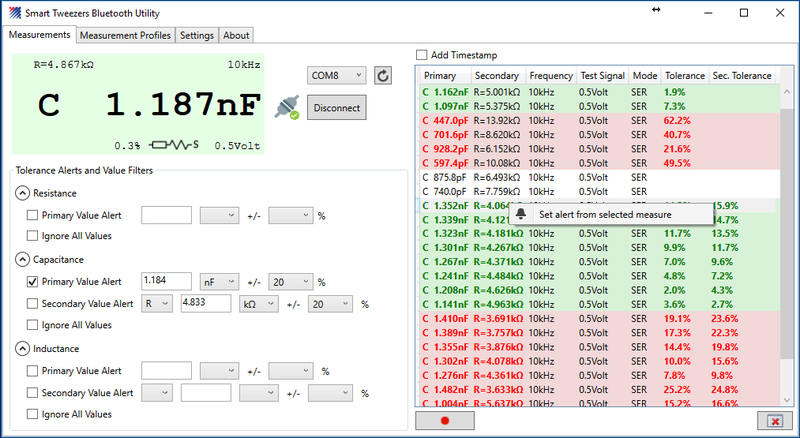 The string is explained as such: main impedance value type, C, and its value, 1.398nF, secondary impedance, R, and its value, the test frequency 10 kHz, test signal level 0.5 V, the measurement mode S for Serial, and 4 reserved values. This information is sent and can be saved into a file or document as required. 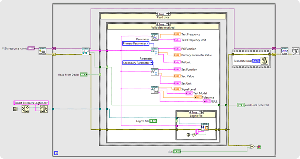 When using LabView® software, the computer could process the data for future use or store it in a database. 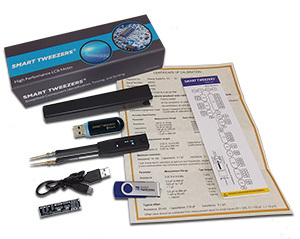 Smart Tweezers ST5S-BT2 is able to connect with PC (using the receiver stick, required) and dedicated apps for Android and iOS. The Smart Tweezers ST5S-BT2 LabView® driver is supported and certified by National Instruments. Using this driver allows a smooth integration with Bluetooth enabled Smart Tweezers. 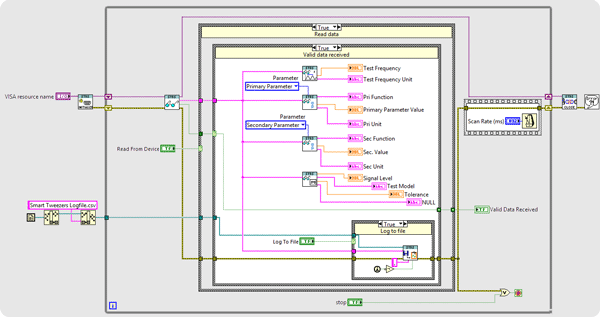 When connected, LabView® can create database storage and log data. 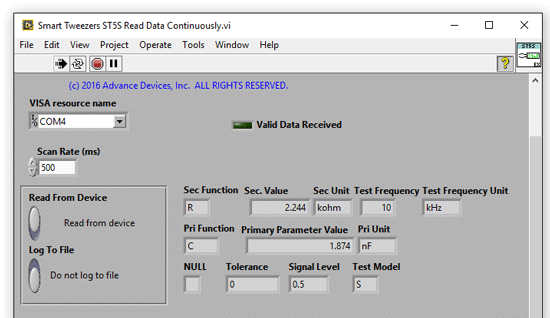 A few examples of the device working with LabView®re available below. Smart Tweezers ST5S-BT2 can be connected to Smart Tweezers Bluetooth Companion on Windows 7/8/10. 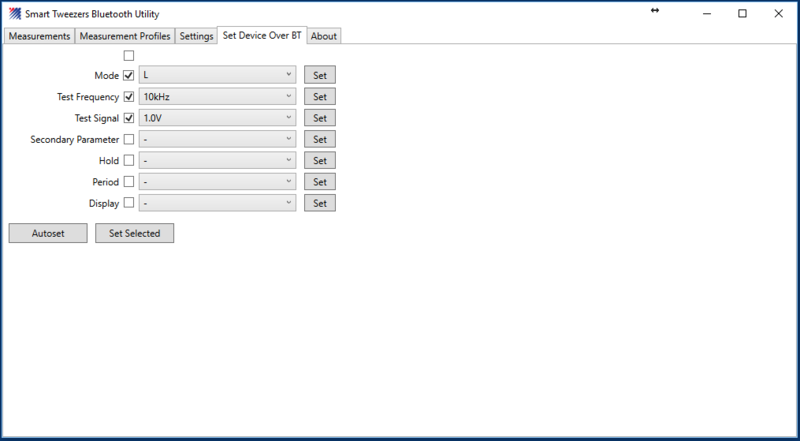 When connected, the ST5S-BT2 device can relay information from the program and the device, including custom profiles and settings. 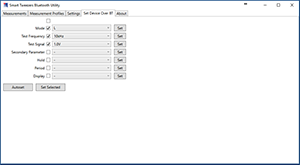 All data sent from the device can be logged using .csv for Excel, or copied and pasted into a preferred file format. Custom profiles can be created from previous measurements or manually. 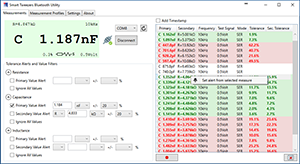 These profiles include measurement parameters and can include device settings such as test frequencies. ST5S-BT2 can connect to Apple or Android phones and tablets. These apps are available in their respective app stores. The apps connect and log data, share data with other connected devices, and help visualize measurements. Using available USB Bluetooth receivers, the Bluetooth Smart Tweezers devices can be integrated into custom user environments. The receiver is based on FTDI bridge and creates a virtual RS232 serial port, allowing for easy connection. Available in the LCR-Reader Store. ST5S-BT2 with receiver stick: $439.88 USD. ST5S-BT2 without reciever stick: $399.99 USD. ��� Siborg Systems Inc. All rights reserved.